Pastor Thomas Francis, who leads a Tamil church here in Dubai picked us up from the airport and was a fantastic host in showing us around. 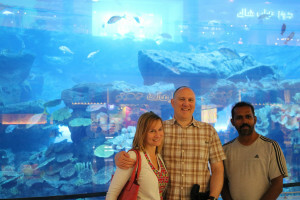 Dubai is very impressive – a city carved out of the sand. As a result it looks both luxurious and like a building site. 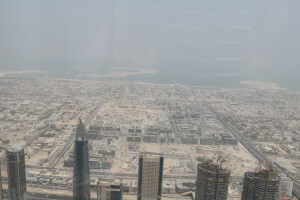 To keep our promise to Amir we took a photo from the top of the Burj Khalifer (828m tall!) looking over the sea to the beautiful Arabian gulf and, of course, Iran. In the heat haze you have to look very hard to make out the coastline. * The third record has not yet been verified by the Guinness book of Records.